Wisconsin might not be the barbeque capital of the world, but there are numerous joints throughout the state that put Wisconsin BBQ on the map. Whether you’re searching for a mouthwatering pulled pork sandwich or a ridiculously-good rack of ribs, you’ll find it in Wisconsin. Find out who made our favorite barbecue joints in the state! New to Hudson, Big Guys BBQ Roadhouse is everything good about barbecue. The rustic barn-wood style will add even more ambiance, their already happenin’ restaurant. Stop by and don’t forget to come hungry! 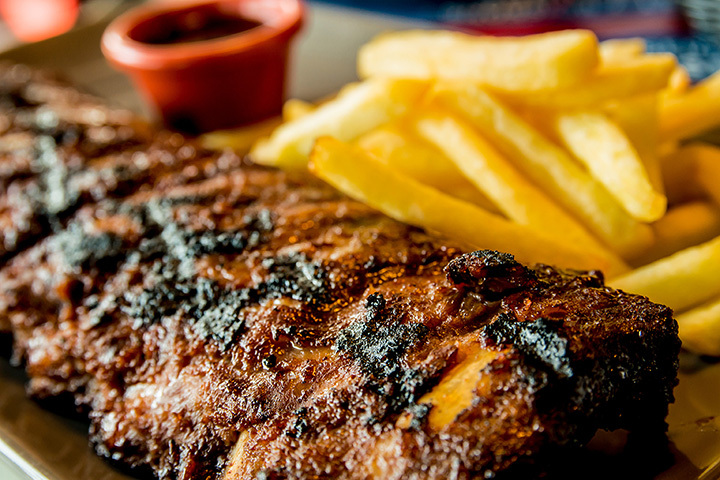 Find out what all the fuss is about at Smoky Jon’s. They offer award-winning barbecue—placing first at the National BBQ Convention last year. Smoky Jon’s has been a Madison tradition for 40 years. Taste the difference at this locally-owned and specifically-seasoned dining spot. Enjoy Southern-style smoked sausage served on sliced up or on a hearty bun. Their fair prices and tasty meals please both the locals and the those who travel far for a good meal. Relax with friends at the Double B with some great tasting barbecue. Their exquisite food can only be told as Wisconsin’s best kept secret. Their tender juicy meats in the heart of West Allis Wisconsin will steal your heart just after one bite. Pat’s Rib Place is a home-style, Southern barbecue eatery located in Waukesha. Take home a bottle of their delicious homemade barbecue sauce, and come back for a refill for only $3.99. Their lengthy menu will have your mouth watering all while reading. Take your coat off and stay a while at Atlas BBQ in Grafton. You’ll never want to leave. Their laid-back bar/restaurant setting is just what you need. Top notch meats, topped with their famous Atlas barbecue sauce, served up with a perfectly pair of sides. If you’re looking for a lengthy menu, with decent prices, and hearty portions—look no further. That BBQ Joint is the perfect place to grab a quick barbecue bite or to camp out for a while. Take one step in the joint and you’ll be immediately drawn by the savory scents. LD’s isn’t your typical barbecue joint as it features counter-served barbecue located within a gas station. Try their slow-smoked, tender, and juicy barbecue options. East Troy’s finest, authentic barbecue palace is the place to be. Line up and come hungry! If you’re looking for a quick tasty bite to eat, Old Southern BBQ in Hayward has got you covered. Their quick-serve neighborhood barbecue joint is adored by many. Make it a complete meal by adding a side dish (or two.) Hayward has something delicious cooking up—try it out!